Review posted May 25, 2009. Recorded Books, 1995. 2 cassettes. 2 hours. While I was toting carloads of my possessions to a new home just a few miles from Bull Run and Manassas Battlefield National Park, this book seemed an appropriate one to listen to. Indeed, it was exceedingly strange to realize that these events happened only a few miles from where I was driving. 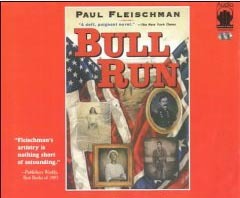 Paul Fleischman tells the story of the first battle of the Civil War by using monologues from all sorts of people somehow involved -- some from the South, some from the North, men and women, white and black, young and old. The Recorded Books version uses sixteen different narrators for the different characters who give their stories. This book expressed so many aspects of the start of the war that I never thought about before. All the points of view are so different. Since it's about war, naturally the story is not pleasant, but it is truly fascinating.